Maintaining weight loss is difficult for many people. There have been times I have lost weight only to gain some of it back within a year. It’s important to know that you must continue the positive habits that helped you lose weight and not revert back to your old habits. The good news is that there are several strategies to help you. 8 strategies to maintaining weight loss. What has been your number one strategy to maintaining weight loss? Plateaus are a pain in the behind and inevitable. If you are in a calorie deficit, your body will plateau at some point. A true plateau is when weight has stabilized for at least one month. Plateaus occur when your body adapts in order to reach homeostasis. Your body is always working to maintain an equilibrium in every aspect. This is why our body’s temperature is maintained at about 98.6 degrees fahrenheit and why we have a sodium/potassium pump. This is a good thing. It means your body is doing its job. Now that we know we will most likely plateau at some point during our weight loss journey, let’s use this opportunity to not freak out and ditch the deficit all together, but to make a plan of action. 1. An opportunity to take a diet break and maintain weight loss. Consider this option if you’ve been dieting for a while. 2. Keep going and push through. Consider this if you haven’t been dieting for long. If you decided to go with a diet break, increase your calories to maintenance. This is when you do not gain or lose weight. Continue the habits that helped you lose the initial weight. That might mean you continue to eat less energy-dense foods, maintain a physically active lifestyle, self-monitoring, etc. The mere act of maintaining weight loss is a huge challenge. If you decided to push through, you will want to either lower your calories and/or increase exercise. Do this for a week and note any changes. If nothing changes, pick one of the above and try again. What strategies do you have for busting through plateaus? There is no secret to losing weight. It’s a well-known researched fact that you must be in a calorie deficit to lose weight. This means you take in less calories than you burn. So, why are there many different diets claiming to help you lose weight. Well, they all result in a calorie deficit. The Keto diet restricts carbohydrates. If you normally eat carbohydrates then decide to go on the Keto diet, you have just eliminated hundreds of calories. This is the same for all diets that require you to restrict food. They all work as long as you limit those foods. An easier solution is to cut back on the foods you already eat without having to cut them out completely. There are many strategies to eliminating calories, but for today’s post we are going to cover calorie and protein counting. How do you calculate a calorie deficit? Step 1. Track your food/liquid intake for 1 week. Weigh and measure all of the foods/liquids you eat and drink. This includes the foods you sample by taking bites and licks. After a week, did you lose, gain, or maintain weight? If you maintained weight, then that is likely your maintenance calories. Step 2. Subtract 100-200 calories from your maintenance calories. If your maintenance calories are 1,600, then subtract 100 calories. If after a week you don’t lose any weight, subtract another 100 calories. Step 3. Calculate your protein needs. It’s important for you to track your protein intake or at least know how much protein to eat. Protein increases satiety, a feeling of fullness. It will also preserve muscle mass while you’re in a caloric deficit. Protein should be between 1.2-2.2 g/kg. If you would rather calculate in pounds, then convert protein needs to g/lb. Step 4. Only track calories and protein. Instead of tracking carbohydrates and fat, eat what you want of the two without going over your calories and protein goals. This will increase the variety of your foods, which will increase the likelihood of you reaching your weight loss goals. The only caveat is that you do not dip below 20% of fat intake. Eating less than 20% of fat will likely cause problems with your hormones and health. Step 5. Give it some time to work. You must have patience when losing weight. It typically takes a couple of weeks to really notice a difference. Give it time and trust the process. 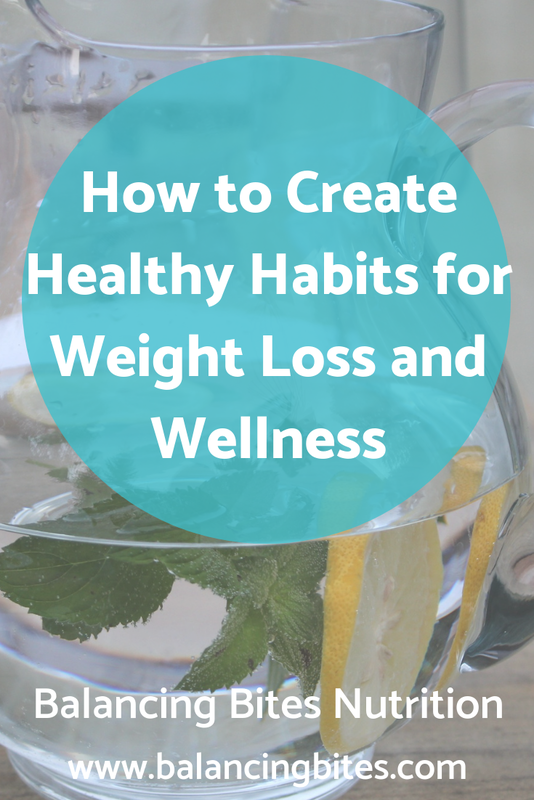 Last week, I discussed how to make healthy habit changes. This week I’m covering key elements needed to lessen the difficulty of incorporating new habits. Think of it as a game plan to creating long lasting health habits rather than winging it. Before beginning any new habits, have a solid plan and a short back up plan. If you’ve decided to change your eating habits, have a few meals and snacks planned and those ingredients stocked. Meal prep once a week for meals you don’t have time to make. Also, have a plan for when you forget your lunch at home or you’re running errands all day. Perhaps you have a local restaurant or grocery store that you can pick up a quick healthy meal. Schedule and plan your workouts ahead of time, so when you get to the gym or park you don’t waste any time. Also, have a backup in case you aren’t able to workout at your usual place. This is where being flexible and having a backup plan is needed. 2. Create a successful environment. Create an environment that is congruent with your goals. If you’re wanting to eat more fruits and vegetables, then stock your kitchen with fresh and frozen produce. If you want to increase your physical activity, make sure you have clean workout clothes. Our bodies are sometimes slow to show changes. One week you can lose a few pounds and the next two weeks half a pound. Then the fourth week, you can lose a few pounds again. It’s frustrating, but a reality. If you are putting in the work, changes are happening. The scale is not the only instrument to document change. Take photos, notice how your clothes feel, and use a measuring tape. These four measurements will give you a better overall picture of what is happening. 4. Each day (or meal) is a do-over. Take this process one day, or one meal at a time. If you overeat at lunch, get back on track for your next meal. If you skipped your workout, get back on track the next day. 5. Above all, be consistent. Consistency is huge. What you do day in and day out ultimately determines whether you succeed or not. One overindulgence or skipped workout will not derail you. Overtime you will be successful. Creating new habits is not an easy process, but it is doable. Whether your goal is weight loss or improving wellness, creating healthy habits is a strategy that can help you reach your goals. The key to creating lasting habits is to start small, choose one that will jump start whatever goal you’re working on, and stay consistent. For weight loss, record your food/drink intake for 7 days and include the amount of food eaten and when. Next, look over your food log and take note of your food preferences and meal pattern. It’s important to consider your lifestyle, likes, and dislikes. You don’t want to change your lifestyle too much or too drastically. Make a list of habits, and pick one that is easy and will have an impact on reducing calories. Stick with that habit for 2 weeks. After 2 weeks, ask yourself if the habit change had any positive affect on your life. If so, continue the habit and add another one. Continue in this manner until you reach your goals. Once you have reached your goals, you will want to continue with your healthy habits. At the bottom of this post, I’ve included a habit tracker you can print or upload to the Goodnotes app to keep track of your habits. Keeping track of your habits is a great way to stay consistent and accountable. Click on the link to download your habit tracker. What healthy habits are you working on?